Data Grid is designed and optimized for high performance. A high volume of data can be loaded without performance degradation by using row and column virtualization. Aggregates for column values can be easily displayed using the aggregate feature. Aggregates can be customized to show their value in individual summary rows, individual group summary rows, or in group caption rows. It have built-in aggregates types, user-defined aggregates for custom formula aggregating and reactive aggregate to view live aggregation changes for modified data column. Using paging, a segment of data can be viewed from the assigned data source. 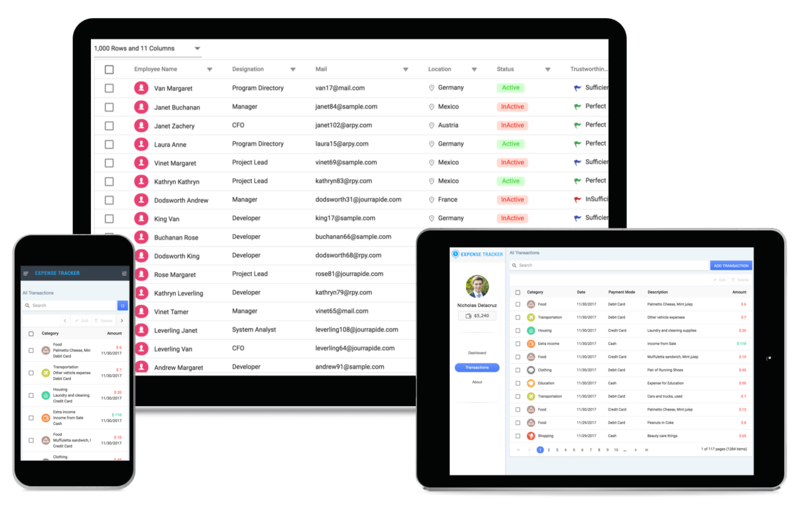 Data Grid offers built-in pager UI with options to customize its entire UI. It also has an on-demand paging mode for effective data retrieval from remote web services. Data Grid rows can be sorted against a column simply by clicking the desired column header. Data can be sorted either in the ascending or descending order. Sorting have option to do initial sorting and Also we can able to write our own sort function for columns. Filtering allows users to view the required data in the Data Grid. The Data Grid supports various filter types such as filter bar, menu, check box, and Excel-like filter. The appropriate filter type can be chosen based on the application. These filter types support number filter, string filter, date filter, and Boolean filter. Options to customize filter operators, case sensitivity, and diacritics are also available. DataGrid supports row grouping to display data in an organized way. Data can be grouped in the ascending or descending order. Rows can be grouped by dragging and dropping the desired columns in the interactive drop area. DataGrid supports to select rows or cells. One or more rows or cells can also be selected by holding Ctrl or Command, or programmatically. Also selection supports to select range of rows or cells and selection by checkbox. Templates can be used to create custom user experiences in the datagrid. The datagrid provides various template options to create custom headers, custom cell contents, custom rows, detail rows, and toolbars. Stacked headers allow grouping and visualizing column headers in a stacked manner. There is no limit to the number of columns that can be grouped. The data columns can still be grouped, sorted, and filtered. Column defines schema of data source in datagrid. Columns acts as base for all features. It supports formatting, auto generate columns, column definitions, and column resize, column reorder, column chooser, column menu, foreign key column and other important features. Export DataGrid data to Excel, PDF, and CSV formats. The exported document can also be customized programmatically. This allows data from the datagrid to be used in other applications.